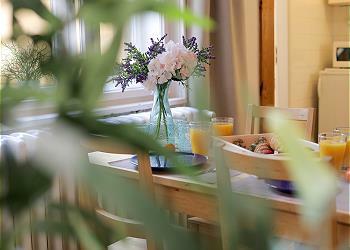 Lili is a colorful and spacious apartment located in the heart of Prague! 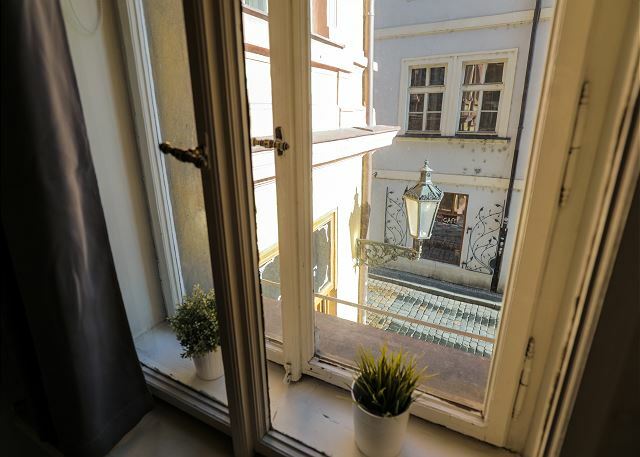 You can enjoy Prague’s magical atmosphere right from the beginning with Lili’s high ceiling, large historical doors and a view from the window of a small street in the Old Town. Lili is large enough for up to 7 people and offers a well-equipped kitchen with everything needed to prepare breakfast and other basic meals. 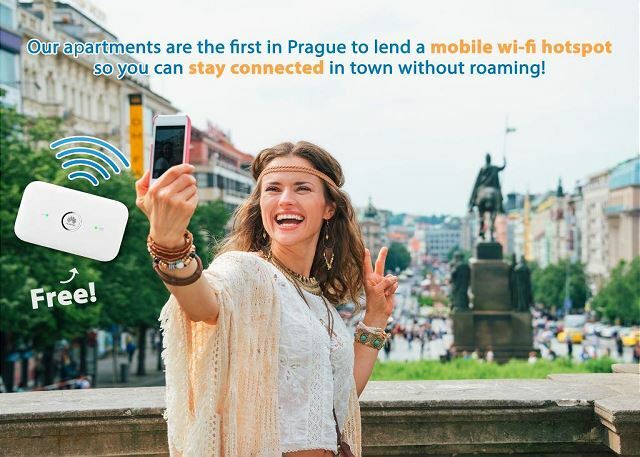 As all our other apartments, Lili has high-speed internet connection for working or planning your next trip through Prague. 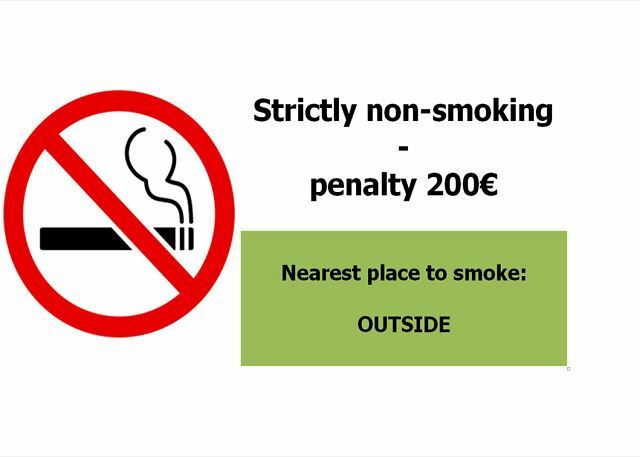 Lili is non-smoking. 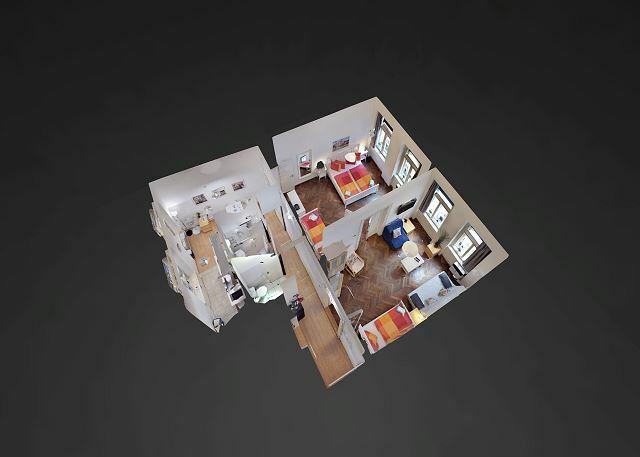 If you want to get a better look at the apartment, scroll down to view the floor plan. For those who have a bit of a sweet tooth, there is a Choco Cafe U Cervene zidle right across the street. The Cafe offers a huge variety of hot chocolates as well as cakes and brusketas, ideal for a light dinner. 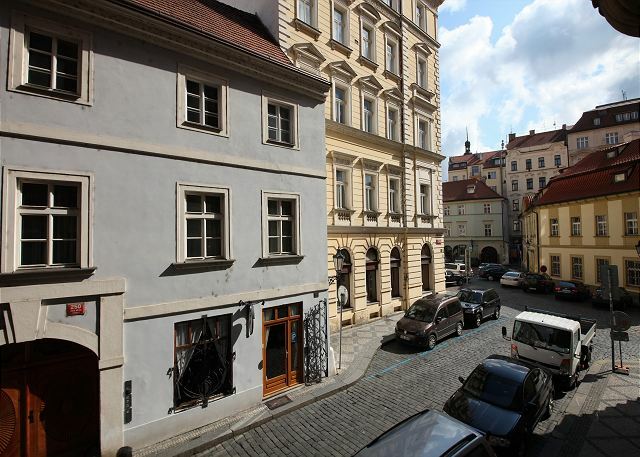 Lili has a fantastic location for exploring Prague since it is only 2 minutes away from Charles Bridge and 5 minutes away from the Old Town Square in a labyrinth of streets in the historical center. 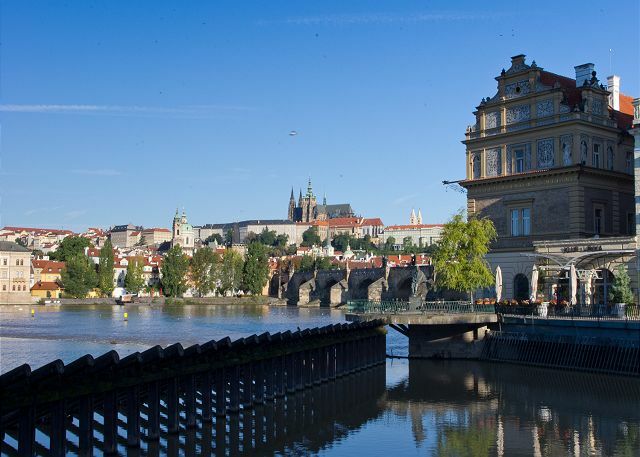 There are also some of the best restaurants and bars in Prague only a few minutes walking distance away. 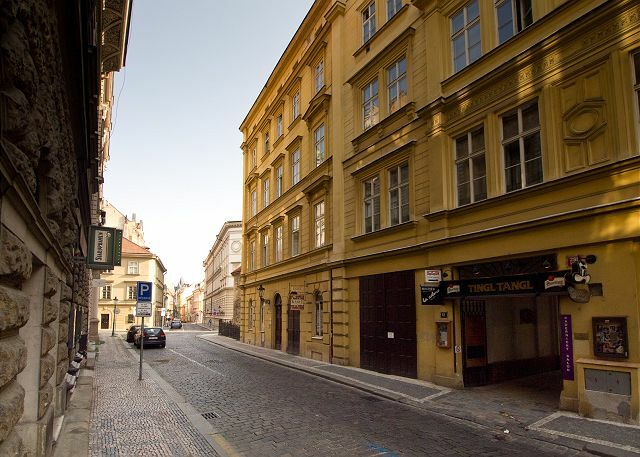 Liliova Street is one of the oldest streets in Prague. The back wall of the former monastery and the Saint Anna Church from the 14th century can be found there. 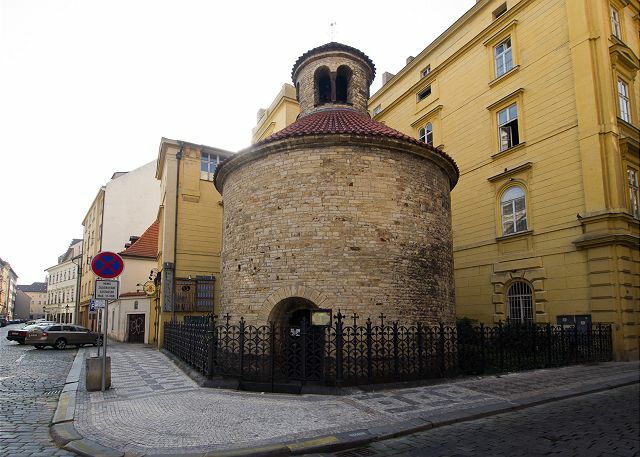 Originally there was a Saint Vavrinec’s rotunda from the 12th century which was later destroyed and replaced by a commendam. After the end of the monastic order, the courtyard was bought by the knights of Saint John and a year later it was bought by Dominicans from the Saint Anna’s monastery. 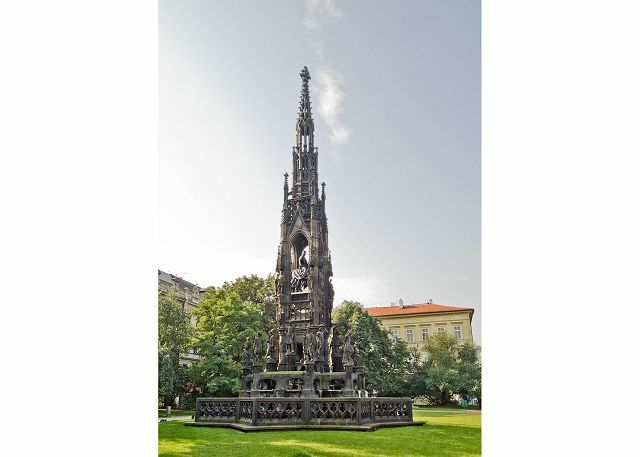 The temple has gothic elements and monumental compositions on the walls as well as being the place of burial of Vaclav Hajek z Libocan, the author of the Czech Chronicle. Liliova Street is thought to be linked with a headless templar who can be seen on a white horse. Apparently, he fell in love with a beautiful girl who walked past the church wall every day. Before he could decide if he should priorities God or run away with his love, the girl matured and married somebody else. The templar went crazy and was beheaded for his mad behavior. The only way you can free him is to stop the horse and stab the rider with a sword. We enjoyed the apartment because it was comfortable, very clean with everything necessary provided and it was right in the center so we could visit without having to take any transport. very good organized, very friendly and competent welcome by driver of rentego-taxi from airport, excellently equipped flat including mobile-wifi(!). We loved our visit to Prague and our accommodation were great. Walking distance to all the attractions. Would absolutely do it again. 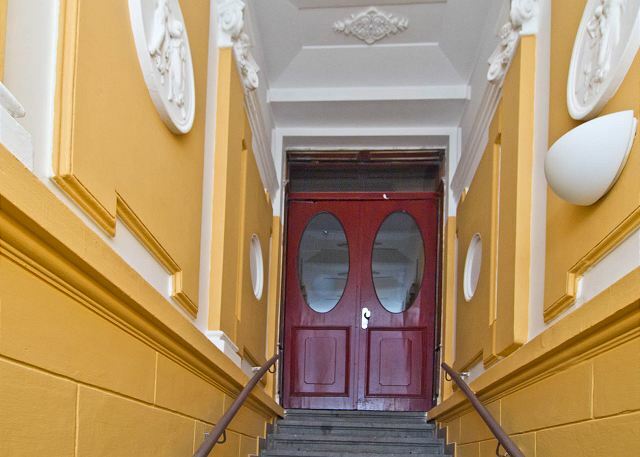 Bright, large apparment in the heart of Prague within walking distance to all touristic obiective, restaurants and attractions. We could not have asked for a better location to stay in Prague! We were able to walk to every place we wanted to visit in Prague. The area was very beautiful. The apartment was clean and nice. Siamo state (4 ragazze) per 5 giorni nell'appartamento LILI. Ottimo soggiorno, tutti molto disponibili sia per l'organizzazione checkin e out che per la consegna delle chiavi e codice. Una zona molto tranquilla con ristoranti nella piazzetta adiacente ma zona silenziosa. Vicina alla piazza principale ed anche alle discoteche più conoscoute. Ci siamo trovate benissimo, consigliata. 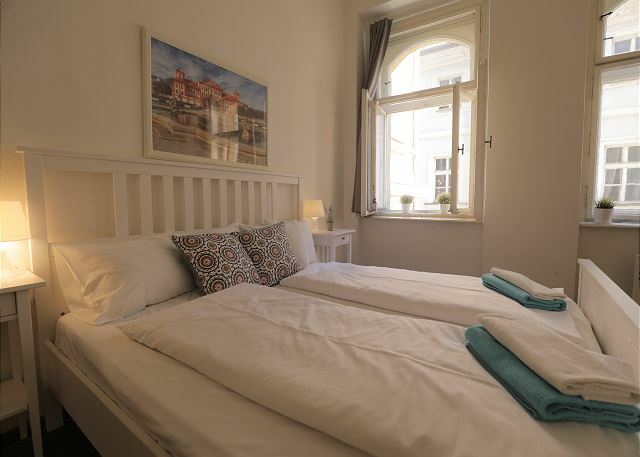 Nice and clean and large rooms in the centre of Prag. Unfortunately, Prague is predominantly used as a party mile all night. So there are always some drunken idiots around, which take your sleep without any regrets. This is, what you must be aware of! 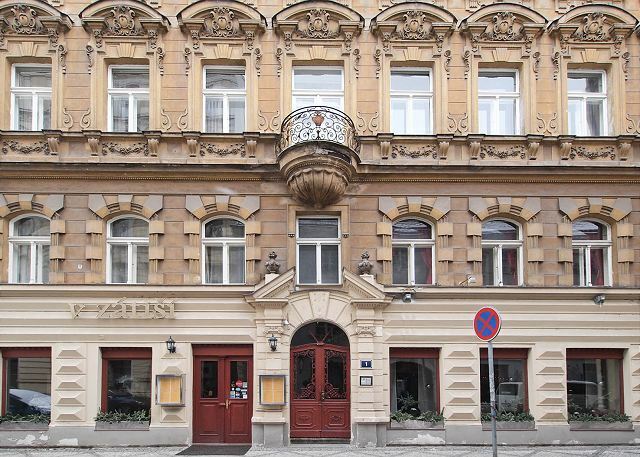 Great Location in the heart of Prague. 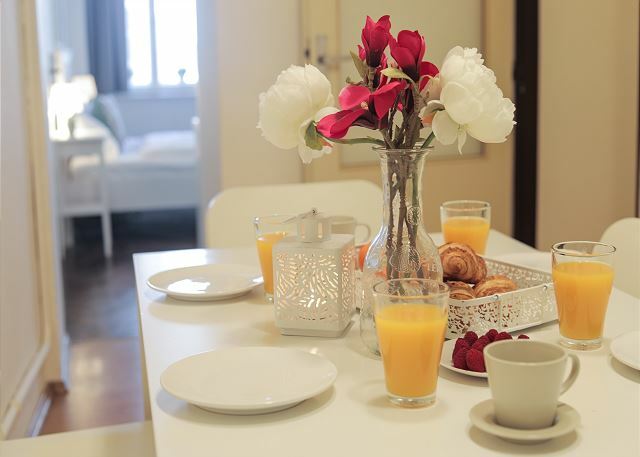 This apartment was a wonderful location and just cannot say enough about how wonderful the RentEGo personnel were. Everything was so easy for us! 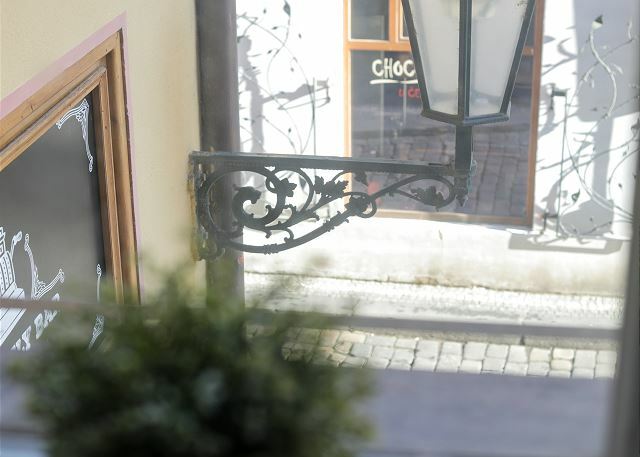 it was an very nice stay.A very good sitution in the center of prague near the bridge st Charles.very easy to find restaurant no expensive,a lot of things to visit and many concerts in more we had had a good weather.Very easy to use bus and Underground. Only one problème is to find an office to change money with taxe not too expensive. Perfect flat, perfect rental service! 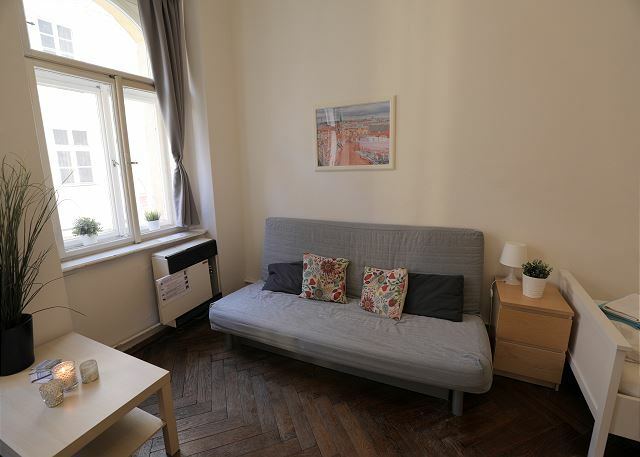 The flat is very well located in the center of Prague. Its confortable and suitable for 5 personns easily. Moreover the Rentego team is very friendly and helping! Late checking and navette organisation was perfect! We will book again! Every correspondence I had with the rental company was quick, efficient, and helpful. 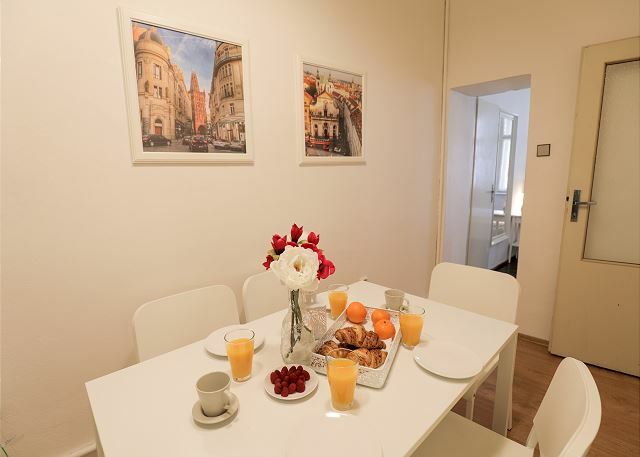 The apartment is close to many restaurants and all the major sights of Prague. It's also close to a Tram stop to take you even further beyond. The apartment was a perfect space for my family. We have three small children (6, 3, and 1). We were able to rent a baby bed that was there on arrival. We had two beds for other two and a couch as well. The kitchen space was nice and we were able to get the kids fed before we headed out for the coffee shoplift across the street! I really enjoyed our stay here! the apt is nice, old, but clean, just in the centre of the city: that was very good. But: first problems with booking the money from Credit card because they wanted to know the PIN. and second problem: the person to meet us when arriving was 15 min late and to return the deposit when we wanted to leave 15 min late again !! it was not raining and not cold at those days, but uncomfortalbe: and not necessary. We had 5 days and nights in Prague, apron arrival our flat was not ready, but that was due to an early flight in and it was already noted that the flat would not be ready until the afternoon. The location was quite amazing! Right in the middle of the old town. The building itself was stunning and surrounded by restaurants, bars and pubs. All local attractions were within short walks. The space was fantastic, offering everything you could want in a home away experience. The only thing that I'd say for anyone staying here is, consider bringing ear plugs for the night, as it is wonderfully situated, it can get very loud in the night, but that aside, everything else was perfect. I would still recommend this flat to anyone. It was a grand experience. The apartment is in a great location.....3 blocks from the Port Charles bridge. Large enough for 5 people and very comfortable beds. In a busy area, but no noise in the apartment. Easy to work with the agency. Nous avions loué l'appartement Lili pour 5 nuits et nous avons passé un très bon séjour : l'appartement est bien équipé, propre et central : la place de la vieille ville est à 5 min, on trouve un supermarché à quelques pas etc. Nous étions 7 et avions toute la place nécessaire. Je recommande ce logement ! Un appartement merveilleux situé dans une rue très calme et proche de l'ancienne ville. This was a familly trip and enjoyed the easy location of the apartment, we hardly used the apartment appart from sleeping. Overall good. There where no toiletries at all in the bathroom so we had to run looking for some. Remember even though is an apartment many people dont travel with their own shampoo or shower gel. Informed company that we'd be arriving in Prague at 7.00 in the morning on overnight train from Krakow, requested early check-in. Not a chance, check-in was only moved from 4.30 to 4.00, which hardly helped. Had to leave luggage at the train station because company won't store it, then walk back to get it. Result: extremely tiring, frustrating day. No other place I've ever stayed at, apartment or hotel, has such a late check-in and won't store luggage. In addition, while sheets and towels were clean (though quite worn), everything else was dirty and/or greasy. Furnishings almost aggressively cheap and charmless. Ladder and broken drying rack stuck in corner of living room. Stained walls. Paint chipped. Locked cupboards in every room, signs everywhere saying don't. Thank you for sharing your experience, Inmaculada. I checked your reservation and in the first email we informed you that there is already a reservation just before yours and the early check-in will not be possible, however that you can leave your luggage in the apartment during cleaning from 13:00. We also offered you to leave your luggage in our private luggage storage in Ujezd 5. We will definitely talk to our team considering the cleaning in order to find out what can be improved. 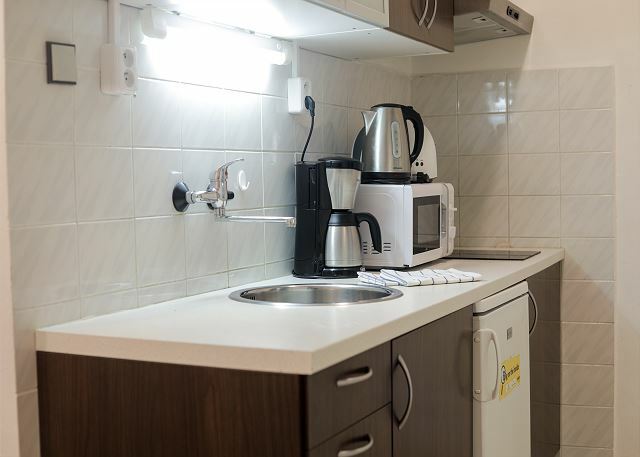 However our apartments are most importantly available for a very good price considering its location, so it's important to keep this in mind while evaluating its equipment, which is mostly basic, but sufficient for anyone who's looking for central, yet affordable accommodation. Everything perfect from beginning to end. Outstanding customer service. Perfect apartment in great location. Look forward to coming back. Pleasant stay in Prague, very nice city, but really too beasy in July. Appartement large and confortable, although a little bit old. We missed a oven in the kitchen. We appreciated the inside and mobile internet. Anyway, best situation to visit the city, in the hart of the centre. People in restaurants and shops not friendly with tourists. Thank you Cecile for your remarks, we are glad you enjoyed your stay in the apartment LILI! The apt was in a very convenient location to be able to walk anywhere. The service was always prompt and accurate. We appreciated that so much. However, I would NOT recommend driving a car in to old Prague. We ended up driving our car to the airport and leaving it there for the couple of days we stayed there. We took a taxi back and forth which made us feel much better. The apt. was in the area where there is a lot of late night partying. It did not bother us at all but for someone that wants peace and quiet and relaxation, this would not work. Une organisation parfaite de rentego tant pour la location que pour le transfert depuis l'aéroport. Une situation idéale de l'appartement Lili près de tous les sites touristiques. Un équipement complet et une surface confortable pour quatre personnes. Un chauffeur compétent et sympathique pour le transfert. Merci, nous sommes hereux que vous avez bien profité de votre séjour. Good location on the center closed to the touristic place, clean, a little bit nous y as far as placed on the center above bar and restaurant. I stayed at Rudolfinum and was pleasantly surprised by the property. It was just what was required and was clean and tidy and value for money. I would certainly stay there again! Lili est un appartement parfaitement situé et équipé. 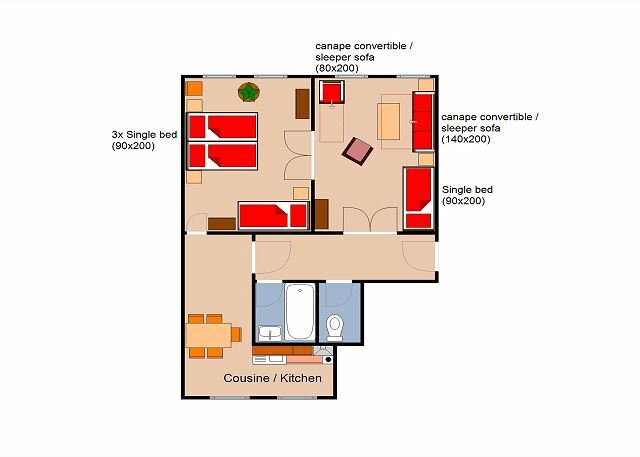 Il est l'un des 4 appartements que nous avons loués avec Rentego pour notre groupe. L'agence (francophone) est très efficace et disponible. Merci beaucoup Severine, n'hésitez pas à nous contacter pour votre séjour prochain à Prague! We loved oure stay in prague. The location is very good, and there is all one needs from a vacation home. One downfauld is the intercom. We had some unwelcome call on it duing the night. We hope that there will be installed a new intercom with a mute butten. besides this miner detail we loved oure stay. Thank you for your nice comment, Iben. We are sorry that you were disturbed by the intercom, there is always a possibility to take the phone off the hook, if you're not interested in using it. Otherwise we are glad that you had a pleasant stay and we would be happy to host you again in our beautiful city! We had a very nice stay in Lili apartment, that is very well located. It is easy to get up early and walk on the Charles Bridge which is very close to the apartement. Property description was acurate. we don't need to complain about anything ! My holidays in this apartment has been good, I would repeat again, care of the house they were magnificent and the facilities available to it. Very nice location in the center of Prague! 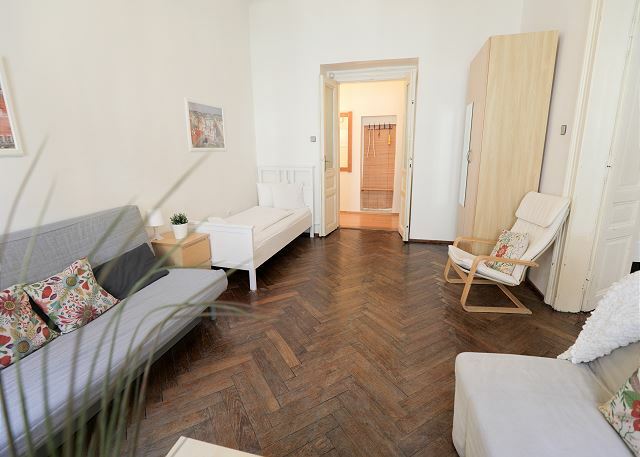 Nice flat in the rally center of Prague, 5 minutes walk from Charles Bridge and from the old city center. The accomodation is confortable and very clean. Since it is in the city center, the neighborood might be a bit noisy. 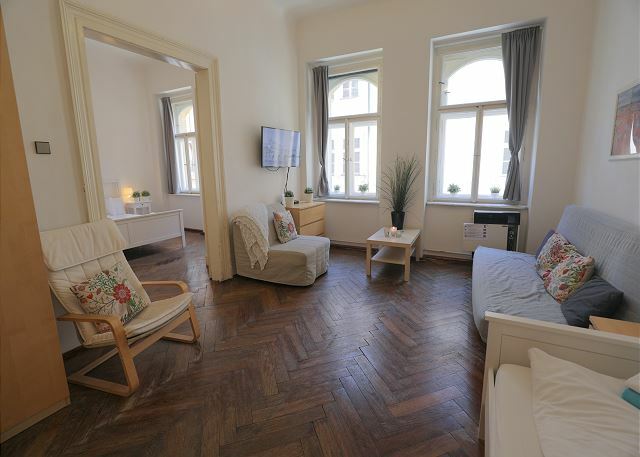 Appartement très bien situé et bien équipé, permettant d’accéder facilement à tous les sites touristiques de Prague. Seul bémol, l'appartement n'est pas bien insonorisé, mais heureusement le quartier est calme. Si vous souhaitez faire un bon repas gastronomique, je recommande le restaurant situé juste en dessous. We are a family of six. Rentego let us leave our bags for the time before we could access the property. The property was clean and in good order and with clear instructions for everything in 3 languages. Excellent location, spacious flat. However, the furniture is very basic (IKEA) and does not really suit the ambiente. There are ladders behind the wardrobes and a dying plant. The bathroom would benefit from modernisation eg glass rather than a plastic shower curtain which has fungus colony and a new shower head. The flat is full of plastic sheets with instructions. The city guide is from 2006. There is no TV or DVD, it would be helpful for those travelling with children. 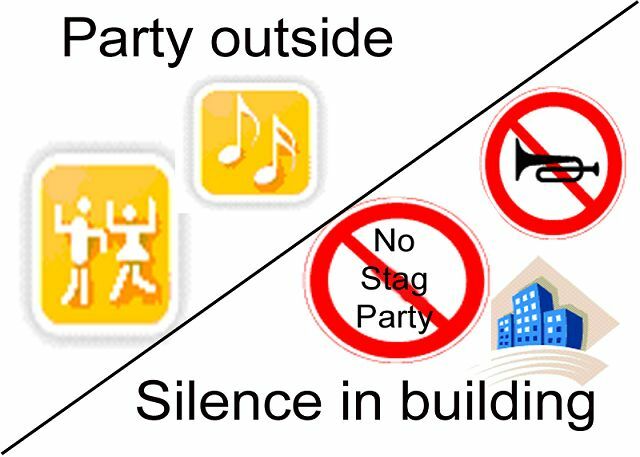 The flat is generally quiet apart from Saturday night which was very noisy. Otherwise the flat is very central and convenient to explore. Good communication with RenteGo. Perfect location,nice apt, great place!! Appartement très bien situé dans une rue calme proche de tout ce qu'il y a à voir. Nous avons tout fait à pieds. No doubt about it - it was absolutely perfect! - Nice clean appartement, perfect location in the middle of the city. Quiet at comfetable. The people in charge of the place are very nice, and very proffessional. the apartment is in a very central location, its big and very well supplied. Nous avons aimé sa situation, son côté cosy et étonnant. Les restos et les bars ne sont pas loin et tout se fait à cinq minutes de marche. L'appart était génial ! Proche de tout rapidement ! La vie à Prague et pas cher! La vieille ville est magnifique et les activités y sont nombreuses! Je recommande vivement cette destination ainsi que rentego pour organiser un voyage sympa en Europe! Very nice location. Minutes walk to old town, Charles bridge, and new town. 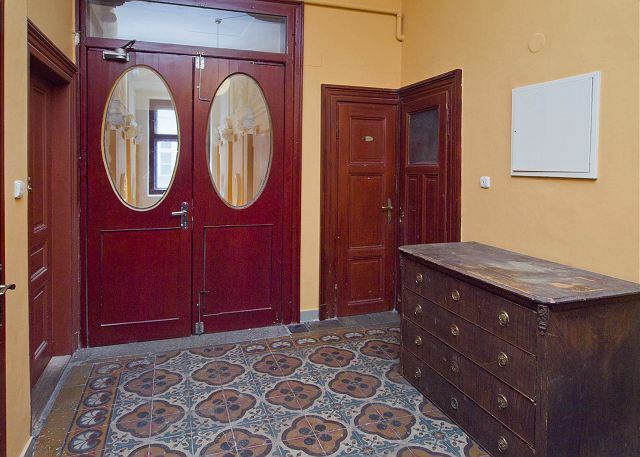 Very handy location, close to Charles Bridge, the square, centre of old town. Great management in delivery of key, payment etc it was a breeze, would definitely recommend this property to a friend!!! appartement tres bien situé . service efficace. Good experience. Rentego service was very professional, even proactive. We got the flat earlier than agreed due to our early arrival. The apartment is in old building (well, its in old city). But it was cleaned and compared to exceperiences from Barcelona i.e. You could get more with same price. Excellent location. Some noise coming from outside. Nice choco-cafe just in front of building. 5-10min walk to all basic sights and malls. 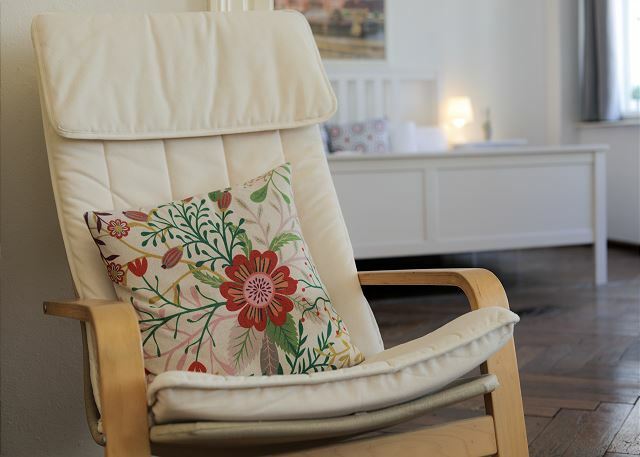 Very exciting experience using Lili apartment : Comfort, clean, price, in the center of old Prague... Everything was outstanding. 7 Persons in total stayed in this apartment for a weekend trip to Prague. IT was enough space for everyone. One blanket was a bit dirty and one of us did sleep with their own blanket. Overall despite this dirty blanket it was great to stay there. Nice country, gorgeous city, great places, good restaurants, to little time. Large group travelling on a budget. We were a group of seven on a budget and this accommodation was excellent in terms of location and price. The booking process was very professional and helpful. 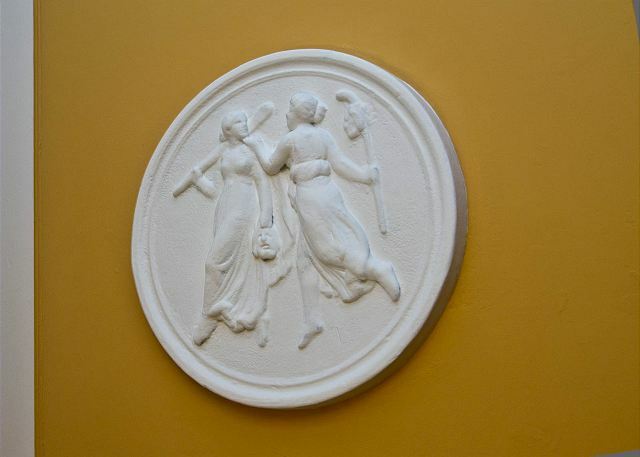 The only negative thing was that there was dirt on the bedroom wall, which should have been spotted and cleaned and the shower tiles could do with a good scrub. There was plenty of room for the number of people in our party and there was a separate toilet, which was more convenient than the other accommodation we'd had on our travels. Car park tip - we had a nine seater car, which didn't fit in the undercover car parks. Go for the park and ride at Nadrazi Holesovice. It cost 120CZk per day, which is about AUD$6 plus the cost of the metro to get back to the accommodation - Staromestska. Also, the info at the apartment was outdated. The mini marts were either no longer open or the hours had changed...and they mostly sell alcohol. There's a Tesco on the corner of Narodni and Na Perstyne. We truly enjoyed our quick visit to Prague and the transportation we arranged. Prague is a lovely city and our accomodations were within walking distance to the lovely town. Perfect accomodations for our family of 5. 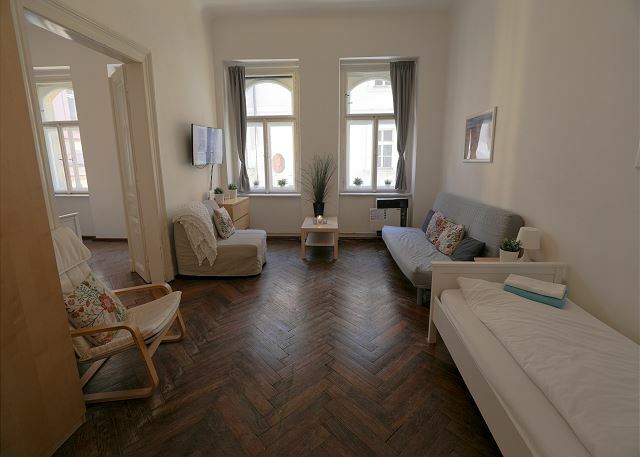 Clean, basic sturdy Ikea furnishings, secure, bright, well-equipped (unless you want a TV, and why on earth would you want a TV when you're a tourist in Prague? ), very helpful rental agency that cheerfully accommodated our unexpected changes in travel plans and a last-minute need to find a new driver to get us to the airport on time. The place is littered with beds (up to 8, I think) and would be perfect for a large family or student group, as long as they respected the no-loud-noise rule. New fans in each room dealt successfully with short-term heat wave. Location was wonderful, minutes from Old Town Square and Charles Bridge, and if your sense of direction is poor, Prague is a wonderful place to lose yourself in. The only glitch was noisy drinkers outside at a local pub one night, which forced us to close the windows and use the fans. Definitely recommended for the budget-conscious and clean-conscious traveller. Je recommande cette location, très pratique, à 5 minutes à pied du Pont Charles, proche de tout. Customer service was excellent from initial booking right through to the final transfer to the airport. We had a number of queries which were answered immediately and to our complete satisfaction. Our family of 6 (4 adults and 2 small children) rented the Lili Apartment for 6 nights during our first visit to Prague. 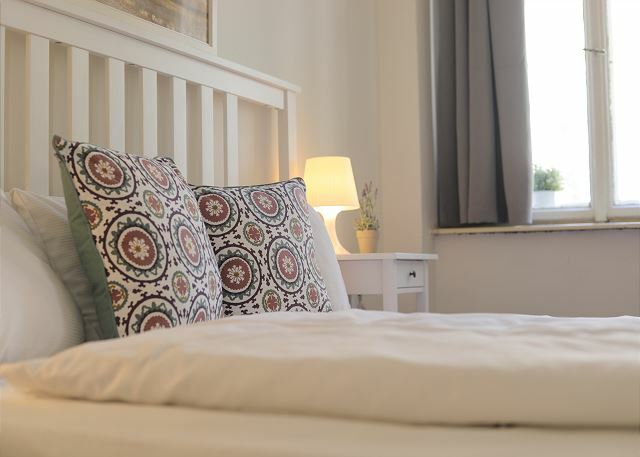 We found the location suberb, within easy walking distance of Charles Bridge and many of the popular Old Town attractions. The furniture was generally minimal, but adequate, and the beds comfortable. Bedding consisted of 3 singles in the bedroom, with another single and a lounge folding into a double bed in the lounge area. The children were well catered for with a high chair, cot and baby bath provided. Although small, the kitchen provided adequate cupboards with a good range of plates, glasses, cutlery etc. Hot plates, microwave oven and a fridge were provided, although we would have used an oven as well if we'd had one. The dining area was quite adequate, although narrow when seating 6. The apartment was quite secure with key unlocking to main heavy metal door, and another internal door to a shared hallway. A code number was then needed to access the apartment. We felt this was very safe and secure. Heating was provided, but we did not notice any air conditioning. We are wondering how we would've coped in there in hot summer temperatures. Free WiFi was provided, and greatly appreciated. Maybe a TV could've also been provided, although we barely missed it. We would have no hesitation recommending this rental group to anyone as their communication was always top rate, and the information provided was always prompt and thorough. A very professional operation. 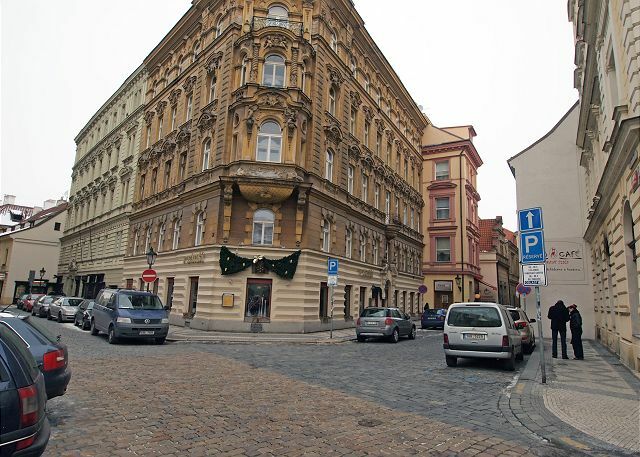 Lili provided us with a wonderful base for our exploration of Prague and several outlying areas of the Czech Republic. Our Rent-e-Go flat was located in the heart of Prague so no need for public transport. It was well equipped, comfortable and extremely good value for money. I had several email exchanges and phone calls with staff who were helpful and welcoming. Highly recommended. It was a really good trip. The flat was near to Charles Bridge where we have celebrate the new year's eve with friends. The equipement in the apartment was correct but we have experienced some troubles (no internet the first day, the toilet flush was dropping all day long and no heating machine in the main room) but nothing important. Besides it was not so clean... But the service RENTeGO offered us was impressive: contacts in case of trouble are really easy! Rentego were easy to deal with and very good at communication. The instructions were simple and accurate and the description of the apartment was very accurate. It was in a great location, and also had two cafes and a lovely little blues bar very close by which was very convenient. I would stay there again and I would use Rentego again also. Nice, spacious apartment very close to old town. This was a great home base from which to explore Prague! Situation geographique de l'appartement tres centrale. Qualité du service de l'agence de location excellent. Easy to work with and quick to respond. You cannot beat this apartment's location! It was just so easy to get everywhere in the city! The Charles Bridge was just a ten minute walk, if that. Old Town Square was another ten minute walk, and there were so many restaurants, bars, and shops all around. It was really a great place! The only complaints we really had was that the shower leaked all over the floor and we had to use the limited number of towels were given to mop that up. Also, I wish the towels were better. They were very rough on the skin from many many washes I imagines. Other than that though, a fantastic place! Beds were very comfortable, the whole place was very clean, and just such a great location. I cannot say enough about the wonderful location!! Thank you, everything was perfect, I would reccomend your agency to anyone: very good assistance and very nice flat! The location is perfect to visit the historical center. Clean, good furniture, professional management. Just a problem: you can ear every little noise coming from the street, even at night! Location is great, even although lots of noise from the street. Could have been cleaner, floors dirty and a few cobwebs around. Les draps d'un lit souillés! It's a very great place! We have spend beautiful hollydays for Xmas in Praha, the flat is very good located, 10 min by feet to every touristics sites. 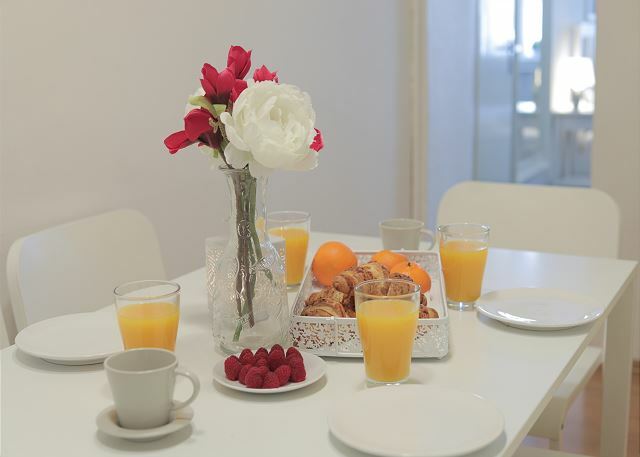 The flat is located in calm street, it's spacious, but it's difficult to cook a lunch or a diner for 5 persons for exemple. A very good experience at least. Nous avons passé 4 jours à Prague dans l'appartement Lili, qui est vraiment bien placé, facile d'accès, spacieux. Félicitaions à RENTeGO pour leur organisation. Encore Bravo ! Very good experience in an appartment in Prague. 4 friends visiting the city during 2 days. The appartment was very good located in the old city and easy to find. Everything was clean. I would recommend this kind of appartment for visiting Prague. Rien à redire. Emplacement en pleine vieille ville, appartement spacieux, documentation détaillée et suivi clientèle parfait. The apartment was VERY central which was great. We truly were only minutes walk from the bridge, the town square, all locations we wanted to see. Everything was okay, and people of Rentandgo were very helpful. The only thing missing though was one bed (the flat was supposed to be for 6 to 7). Luckily we were with a child. Dear Marie, the apartment is indeed supposed to be for 7 persons - see the bedding description on our website (the 7th bed is only temporary, hidden under the bed) / 4 Twin 1 Sleeper 1 Other- extra mattress hidden under a bed. If you plan to use it, please bring your own sleeping bag. In case you haven´t noticed, we apologize for the inconvenience and hope your trip was succesfull otherwise and to see you again in Prague :-). Prague is a wonderfull city and this location was perfectly situated in the center of the old town. Appartement calme et très bien situé. Un ouC3?jour parfait ! The apartment LILI is very well located. We have done all our excursions on foot, without taking public transit. The place where the building is located is very quiet. Documents supplied to access the apartment were very clear. The apartment LILI is very well located. We have done all our excursions on foot, without taking public transit. The place where the building is located is very quiet. Documents supplied to access the apartment were very clear. The documentation found in the apartment, we had supplied very practical information and some good restaurant adresses. I highly recommend this rental. Great flat, great service, thanks !